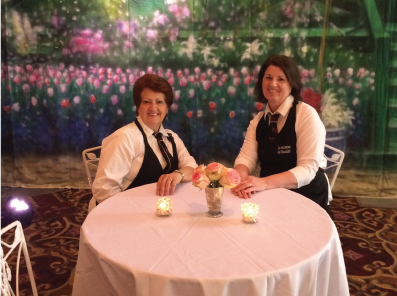 Our family has been serving the Metro Detroit area for the past 13 years, and we can’t wait to meet yours. We use only the highest quality ingredients, from imported Belgian chocolate to fresh fruits. We pride ourselves on providing you with the best experience possible for your event. To dip or not to dip? If not, your guests can still enjoy our delicious treats and fresh fruits. Only in our dreams, have we imagined a place where rivers of chocolate flow freely, surrounded by a bounty of juicy fruits and tasty treats. This delicious dream can be your reality with La Fontaine de Chocolat. We provide the ultimate chocolate experience: Rich Belgian Chocolate cascading over three tiers surrounded by a huge array of dipping treats. From strawberries, bananas, cherries, and pineapple to creme puffs, Oreos, brownies, and marshmallows, the only limit is your appetite! From wedding receptions to corporate banquets to family celebrations, La Fontaine de Chocolat adds a unique and attractive dessert addition to any event. We are now pleased to offer, along with our already popular chocolate fountains, appetizer cheddar cheese fountains, caramel fountains, maple syrup breakfast fountains and our brand new indoor s’more bar. Thank you so much for helping to make our day so special. The chocolate fountain was amazing and we received so many compliments! I just wanted to say thank you! The chocolate fountain was perfect. Everyone enjoyed it and it made my Diamond Event even better. Thank you very much for making the last minute trip up to our school for our 8th grade party. The kids loved the chocolate fountain and it made a great impression at their celebration! Thank you for the wonderfully delicious chocolate fountain and the great price! Everyone was entertained and impressed, and a good time was had by all! Yum! © 2019 La Fontaine De Chocolat.